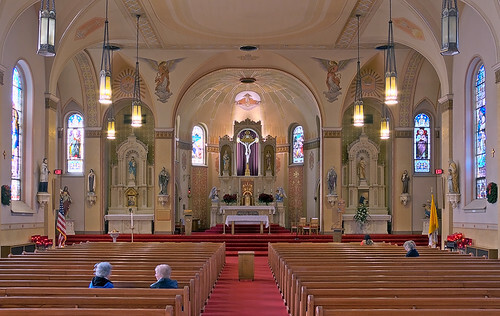 HERE ARE PHOTOS of Saint Peter Church, in Saint Charles, Missouri. The church is located above the historic Main Street, about 23 highway miles northwest of downtown Saint Louis. This exterior photo dates from December 8th, 2007. The following are from January 1st, 2008. Saint Charles was established by Frenchmen, under Spanish colonial rule, in 1765 as Les Petites Côtes, "The Little Hills". The town received the name San Carlos, after Saint Charles Borromeo, in 1791, upon the establishment of its first permanent parish of that name. The first church was a French language parish, but later immigration required ministry in German. 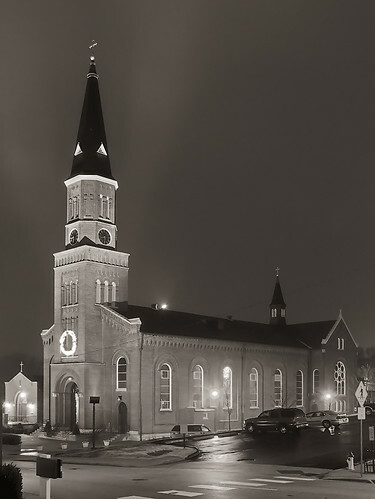 "In the 1830's many German immigrants came to Saint Charles. They longed for a church in which their native tongue might be heard in prayer, song, and sermon. They were granted the right to organize by Archbishop Kenrick, and the cornerstone of the Church was laid on September 19, 1848. The first Saint Peter Church was of wood construction, a country-style church housing a school on the lower level. 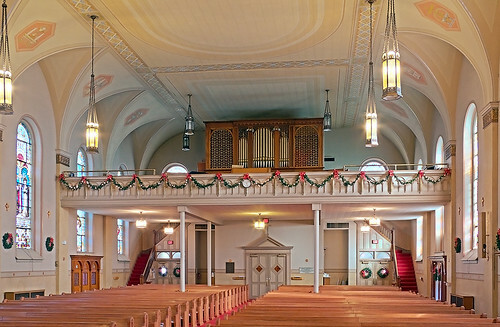 "In 1861, plans to enlarge the church were developed. A large storm unroofed the entire building and damaged the church interior. A cornerstone for construction of a new brick church (the current structure) was laid on June 13, 1861. When the construction of Saint Peter Church was completed, it was the largest Catholic Church west of the Mississippi River. "The bells were installed in the church steeple in 1867. The clock tower and organ were added to the structure in the early 1870's. 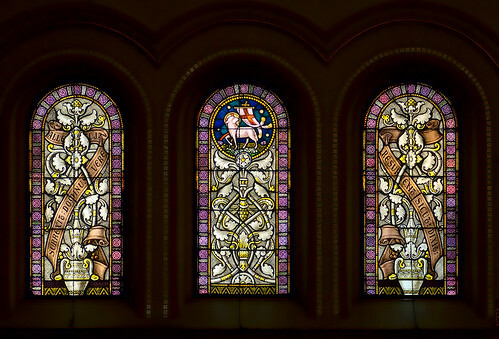 The stained glass windows were placed in the church in 1888, and the church was redecorated in 1894. In 1910, the church was enlarged to include the large sanctuary, two sacristies, and a transept. Re-decoration of the church occurred in 1944, and the original organ was replaced in 1947. 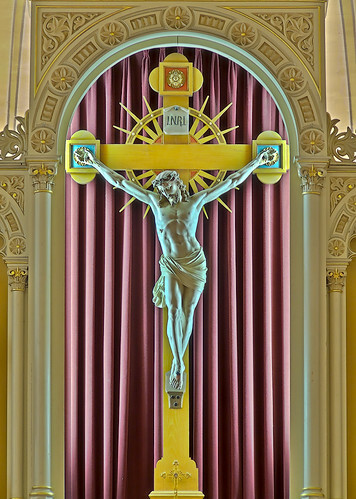 "The statues of the Sacred Heart, Saint Anthony, Saint Peter, and Saint Paul are sculpted from hand-carved wood and have resided in the church since 1861." 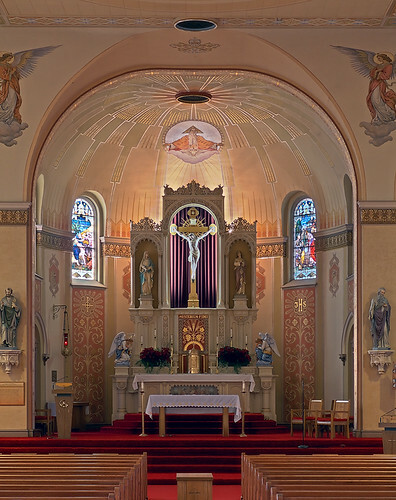 According to the 2007 census, this parish has approximately 8,519 Catholics, and is served by three priests and two permanent deacons. 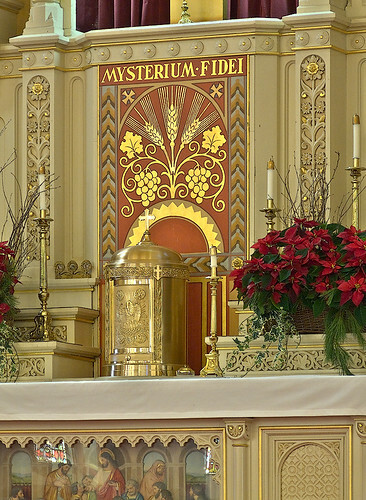 This photo taken before Mass. 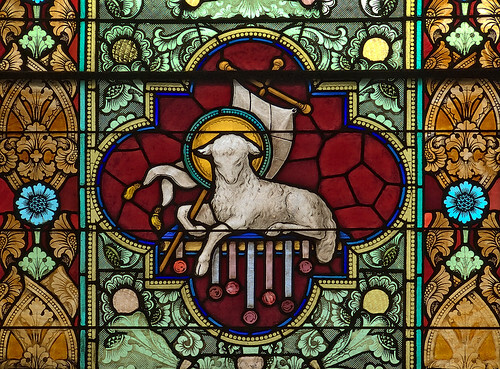 Windows in the sanctuary include Old Testament scenes of Moses, the sacrifice of Abraham, and the Priest-King Melchisidech; all prefigurements of Christ, and a window with the four living creatures — symbols of the Evangelists — as found in Ezechiel and the Apocalypse. Above the sanctuary is the Pope's mitre and keys, with the inscription Tu es Petrus, You are Peter. This church has far more iconography than what I've shown here. Some of my older photos are found here, here, here, and here. 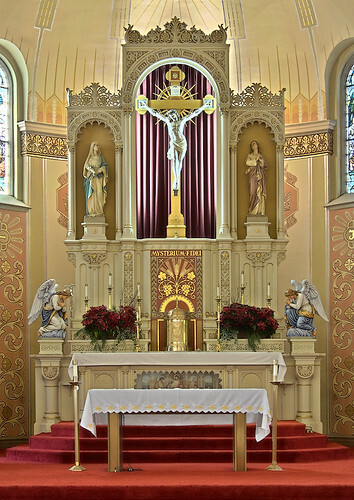 The wooden Altar of Sacrifice, containing an altar-stone with relics, is in front of the old High Altar with the Tabernacle and Crucifix. 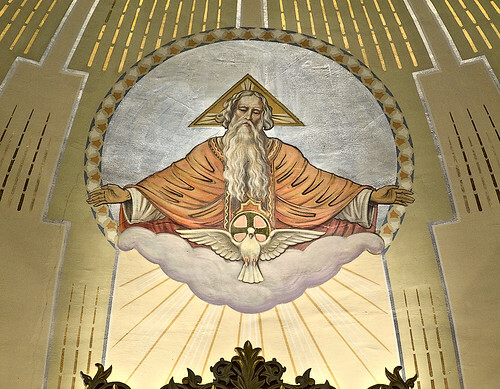 Symbols of God the Father, with triangular halo, and God the Holy Ghost as a dove, painted above the crucifix. 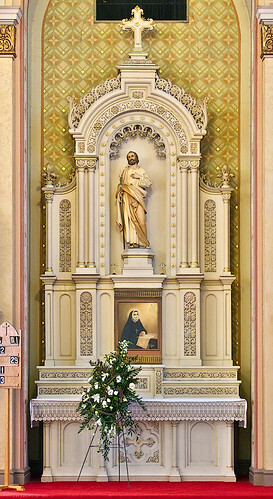 Altar of Saint Joseph features a painting of Saint Rose Philippine Duchesne, who missioned, and is entombed, six blocks to the north of this church. 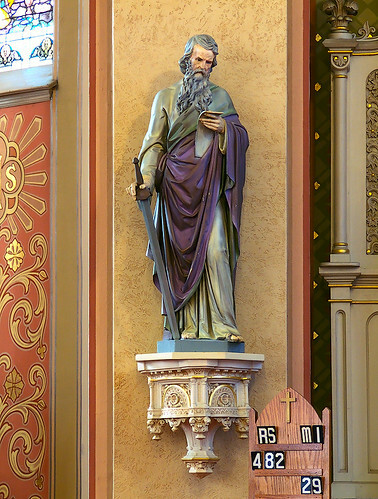 Saint Paul, holding an epistle and the sword of his martyrdom. Christ as the Lamb of God, which is sacrificed on the Passover, sitting on the book of the seven seals from the Apocalypse. VIXIT AN. 57, IN SACERDOTIO AN 34. ♰ DIE 31. JAN. 1890. These pictures are beautiful! They are clear and show people how nice this church really is! 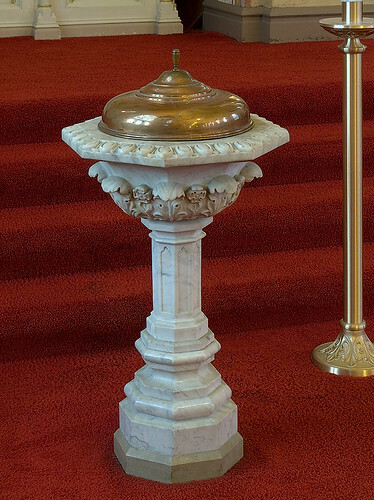 I especially like your photo of the tabernacle. I got married in this beautiful old church a little over 2 years ago. We had the option to bring flowers for decorations, but it truly was not necessary. I have been here many times. Just look at the pictures. I dont need to describe it. It is across from St Josephs Hospital and you can not miss it.The very worthy pastor is Father Steve Bauer.